KISS guitarist Tommy Thayer recently unveiled his new signature Les Paul guitar. The Epiphone Tommy Thayer Signature "Spaceman" Les Paul features a solid mahogany body and a plain maple veneer top that deliver the classic tone and sustain that can only come from a real Les Paul. Thayer will be on hand to promote the guitar’s launch at the 2013 Winter NAMM Show in Anaheim, California, later this month. 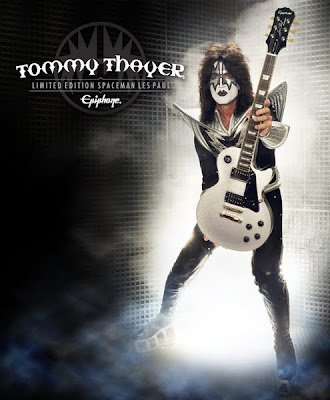 Epiphone has released a new promo video with Tommy displaying his new signature axe.